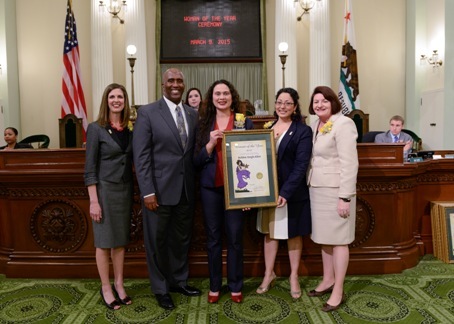 In a ceremony held last Monday at the State Capitol, Elk Grove Unified School District Trustee Bobbie Singh-Allen was honored as the California Assembly's Ninth District Woman of the Year. Woman of the Year by Assembly Member Jim Cooper. Bobbie Singh-Allen was appointed to the Elk Grove Unified School District (EGUSD) in August 2012 and re-elected in November 2014. She was elected Board President in December 2014. Since joining the school board, she has been a leader in anti-bullying initiatives, dedicated to promoting multi-cultural awareness and diversity appreciation. Singh-Allen is a leader in the Indian-American community. As a member of Indian Association of Sacramento and Indus Valley American Chamber of Commerce, Singh-Allen inspires her community to increase civic and political engagement. Currently, she is the only Indian American women in elected office from the Sacramento region.